Stumbled upon an interesting article while I was checking out Ningin this afternoon. nt2099 talks about how many schools in Japan are starting to offer slacks as an option for females as opposed to always wearing skirts year round. Is this the beginning of a trend away from cute Japanese schoolgirl skirts? I polled you all a few months ago about whether or not Japanese schoolgirls should have to wear skirts in the winter. 123 of you said yes they should have to, while 80 said no. I suspect those 80 probaly do have some sort of Japanese schoolgirl fetish because I doubt they would be wearing shorts in the winter like the girl to the right. Slacks are easier to move around in, but there’s a very strong image that schoolgirls wear skirts. And school is the only time in our lives that we can wear these uniforms. 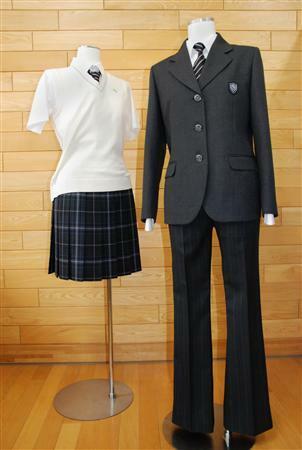 At Sapporo Municipal Minamigaoka Junior High School, slacks have actually replaced skirts for female uniforms for the majority of the year. Females will be able to wear the skirts during the 3 hottest months in the year, but will be required to wear a uniform similar to the male uniforms for the other months. The female uniforms are to the left. While it is still early, we can expect this trend to grow as functionality will replace the schoolgirl image. I think the younger girls will be the first to really be required to wear the slacks as it is easier for them to accept change, especially they grow up wearing slacks in school. NT2099 via Mainichi.